In 2014, the dry, arid climate persisted in Northern California marking the second year of the drought. The winter was unseasonably warm and dry which encouraged early bud break. Spring came with perfectly timed, gentle rains which added lushness to the growing season and balance to the vines. 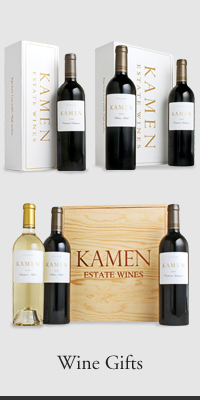 Summer temperatures were moderate and consistently warm, producing peak fruit flavors and enhancing the floral aspects of the 2014 fruit which reflects the terroir of Kamen Estate. Our 2014 Cabernet is incredibly balanced and sings from the glass with layers and layers of heady aromas and concentrated flavors. Wild blueberries, tree ripened plums, raspberry popovers, marzipan, graphite, licorice whip, milk chocolate and forest floor. The estate’s hallmark notes of violets and crushed rock are ever present. This wine is supremely generous and approachable in its youth, however, its elegance and power make a strong argument for cellaring over the next 20 years. “The biggest cuvée that Herold makes for Robert Kamen is the 2014 Cabernet Sauvignon, at 2,100 cases, from a vineyard dominated by the volcanic basalt elevation between 1,100 and 1,500 feet. It sits above the iconic Monte Rosso Vineyard, owned by Gallo. Blueberry and blackberry fruit, forest floor, dusty/loamy notes, roasted herbs and meats all jump from the glass of this opaque purple wine. It’s dense, rich and built for long-term cellaring, this wine can be approached now because it is a 2014, but likely will evolve for 25–30 or more years.” 96+ points. 100% Estate Grown Cabernet Sauvignon at elevations of 1100–1450 ft.